by Charles A. Moss, M.D. 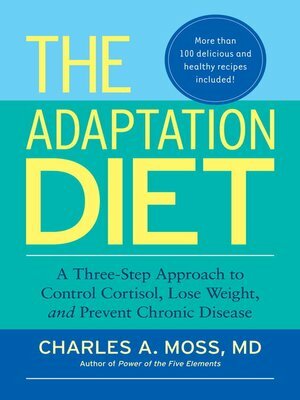 The Adaptation Diet presents a plan clinically proven to lower levels of cortisol, the main stress hormone and a major component of the obesity epidemic. Dr. Charles Moss takes readers through a three-step program—detoxification, elimination of common food allergens, and the implementation of an anti-inflammatory diet—with specific advice on the avoidance of toxins and the inclusion of key bioactive, cortisol-controlling foods and nutrients such as flaxseed powder, cold water fish, specialized herbs, and vitamins. In addition, using the newly emerging science of epigenetics, he explains how diet and environment influence our biological destiny, and he provides more than 100 delicious recipes, as well as menu plans, for life-long control of biochemical stress. You'll learn which foods protect gene expression and help reduce your risk for obesity as well as how to protect your children's gene expression before they are even born. By following the right dietary suggestions, we can change ourselves right down to our genes and reduce our chances for disease. More about Charles A. Moss, M.D.